Overall, the 2014 legislative session ended in a draw. On the win side, we were once again able to stop the fracking bills (no companions were even filed in the Senate.) And the Environmental Regulation bills (HB 703 / SB 1464) both died in committee. Another win was that there was no fertilizer preemption bill or amendment for the first time in years. We were able to get SB 1576 Springs by Sen. Dean passed by the full Senate 38-0 but were unable to even get the bill considered by the House. And the budget, while good for the Everglades and Indian River Lagoon projects, was disappointing for Springs restoration and for Florida Forever funding. Next year we expect there will be a lot of focus on water, but what happens will depend in large part on whether voters approve the Florida Water and Land Legacy Constitutional amendment in November. If they do, there will be a battle royal over the money that will become available. There will have to be an “implementing bill” that places into the Florida statutes the laws that will carry out the intent of the amendment. And there will be lots of interests at the table looking for a piece of the estimated $631 million the amendment will make available. If voters do not adopt the amendment, the prospects for restoring and protecting Florida’s waters and for land acquisition will remain at the mercy of the appropriations process, where they have not enjoyed stellar success in recent years. Even if the amendment passes, there is no guarantee that an implementing bill will be passed next year. The constitutional amendment adopted in 2008 exempting renewable energy home improvements from ad valorem taxes waited five years for the legislature to implement the change. The same could happen with the Water and Land Legacy. Incoming Senate President Andy Gardiner spoke in support of the Springs bill during the past session, but incoming Speaker Crisafulli is quoted saying the bill is the “wrong approach.” It would be a mistake to pre-judge what the legislature under its new leadership will do, but it would also be a mistake to relax. The focus on water issues this year was heightened by the plight of the Indian River Lagoon and the impact of nutrient laden discharges from Lake Okeechobee to the St. Lucie and Caloosahatchee Rivers. Indeed, the Lagoon and surrounding area did well in the budget. We’ll see what the weather brings in terms of rain that may result in more discharges to the East and West and how that plays out politically as we head into the Elections in November. This budget information was provided by Sierra Club Florida’s new administrative lobbyist, Stephanie Kunkle. Stephanie will be working on a number of campaigns over the summer, including Beyond Coal, but she also enjoys deciphering the budget process. I look forward to working with next session. First, let me put the dollars in context. The categories below add up to almost $400 if the full $40 million from the sale of non-conservation lands is realized. But $400 million amounts to just over one half of one percent of the total $77 billion state budget for the coming year. To provide another contrast, consider line 1890 of the budget which includes this language: “From the funds in Specific Appropriation 1890, $10,000,000 is provided for Quiet Zone improvements in response to the use of locomotive horns at highway-rail grade crossings.” In other words, half of the total sum allocated for Florida’s Springs is to be used to keep the noise from railroad locomotives down. It’s sure important to keep the state’s priorities straight. Allocation comes from $40 mil in sale of non-conservation state lands plus $10 mil in General Revenue (GR) and $7.5 mil in State Trust Funds (TF). edited Proviso: of the funds, $12.5 mil must be used for land acquisitions that are less-than-fee interest, with partnerships where the state's portion of the acquisition cost is no more than 50 percent, and for conservation state lands needed for springs protection, military buffering or water resource protection. From this line item $5 mil is provided for the Rural and Family Lands Protection program within DACS. These water projects include everything from stormwater, to freshwater supply, to sewer system improvements. Gov. Scott vetoed a good number of them last year, so it will be interesting to see how may survive in an election year. HB 71 the Fracturing Chemical Usage Disclosure Act would have required the disclosure of fracking chemicals used in oil or gas wells, but HB 157 Pub. Rec./ Fracturing Chemical Usage Disclosure Act would have also provided the industry with a mechanism to keep any chemicals secret by claiming they were a “trade secret.” The bills were heard in committee before session started but were not heard in their last committees during session and died. Renewable Energy advocates were unable to make headway during the 2014 session. The legislature continued its repeal of the last vestiges of pro-renewable/solar provisions in statute with the passage of SB 1044 Building Construction Policies by Sen. Simpson / HB 7147 Department of Agriculture and Consumer Services by the House Energy and Utilities Subcommittee. This bill struck the word “solar” and replaced it with “renewable” in numerous places in statute. It also repeals the Solar Energy System Incentive Program and the Energy Efficient Appliance Rebate Program. The bill also includes natural gas liquefied petroleum gas and coal-derived liquid fuels in the definition of “alternative fuels” and substitutes a generic description of a building energy efficiency rating system for the current rating systems established by the Residential Energy Services Network, the Commercial Energy Services Network, the Building Performance Institute, or the Florida Solar Energy Center. There were three proposals for constitutional amendments dealing with renewable energy, and none of them made it to the floor. Sen. Brandes’ and Rep. LaRosa’s SB 916 / HB 825 would have extended the current exemption from ad valorem taxation (real estate taxes) to commercial properties to match the existing exemption for residential property that was just implemented in 2013. Sen. Brandes was able to move his bill through two of its four committees, but since Rep. LaRosa was unable to convince Rep. Workman, chair of the House Finance and Tax Subcommittee, to agenda the bill, both bills died. Neither of Rep. Dudley’s amendments was heard in committee. However, he plans to move them forward over the next two years through the citizen initiative process. As noted above there was no fertilizer preemption bill this year. This issue may subside as more and more local governments have adopted strong fertilizer ordinances and are willing to fight to keep them because they work. Also, the green slime in the state’s waterways this year made it difficult to speak out for lawn fertilizer. However, the Department of Agriculture and Consumer Services is doing rulemaking on the labeling requirements for lawn fertilizer and it appears they are ignoring the findings of their own scientist, Dr. John Cisar, who studied rainy season application bans and found that they do not damage turf grass. The proposed rulemaking calls for putting down nitrogen during the summer, even in South Florida where the rainy season causes fertilizer to run off into water bodies and algae is rampant. The fertilizer industry kept its head down this session, but could well re-emerge next year. The Springs bill was amended in its last committee to remove all recurring funding from the bill and to leave it dependent on the legislature’s appropriation decisions. This decision put local governments in the opposition’s camp as they will be looking at substantial costs associated with wastewater treatment upgrades and septic tank conversions to sanitary sewers with the added requirement that owners of septic tanks not be charged for the hookup. One potential source of revenue for these projects may be the Water and Land Legacy amendment if it is adopted by the voters. A number of legislators have said they expect the amendment to pass, even if they don’t think it’s a good idea, and they see that money as a way of addressing some of the local governments’ concerns. Water and wastewater utility rates will probably have to be raised as well. Sierra Club will be watching to ensure the goals of the Water and Land Legacy are not sacrificed to expediency. We also worked to get DEP to do a study to evaluate the efficacy of the Department of Health rules governing the practice with respect to water quality. While the bill passed all of its committees in the House and passed the full Senate, it did not receive a final vote and died in messages. Since the bill did not pass, the deadline for ending the land application of septage remains January 1, 2016. DEP has said they will be doing the study we had called for in the language of 1113/1160. We hope to continue the progress we made with other stakeholders on this issue next year. While Sierra Club is willing to recognize the need for funding and infrastructure to transition from land application to more sustainable practices, we are not willing to turn a blind eye to threats to water quality. This legislation provides for a study of reclaimed water and was an instance of being able to amend a bill to address our concerns without having to oppose it. The original language of the bill conflated excess surface water and stormwater with reclaimed water. The environmental community wanted to be absolutely certain that these terms not be considered equivalent since nature has important uses for “excess surface water” and stormwater – like replenishing aquifers and providing hydration needed for habitat. The bill sponsors accepted a clarifying amendment and the bill passed. SB 372 would have exempted from the DRI process all developments with multi-jurisdictional impact in a total of fifteen counties. Worse, the exemption would have extended to the rural parts of those counties, not just the areas inside urban service boundaries. The rationale for the bill offered by the sponsor was that counties with over 300,000 people and an average density of 400/ square mile would have planning departments that are sufficiently sophisticated to address complex and large developments. However, the competence of local planning departments notwithstanding, the incentive for a local planner to take a regional or statewide view is nonexistent. The bill would have promoted sprawl. The bill passed three of its four committees but since the companion, HB 241 by Rep. Gaetz, had not been heard in even its first committee, 372 was allowed to die in Senate Rules. Sen. Galvano has indicated he may bring it back next year. 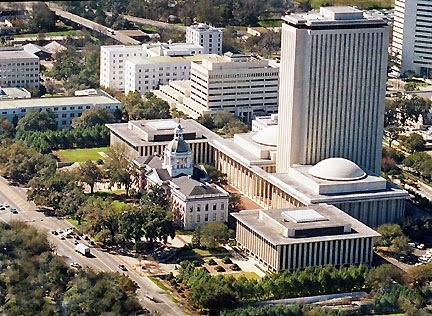 This omnibus bill deals with subjects ranging from the rural Job Tax Credit Program to Space Florida. It was also the target of an amendment to prohibit local governments from imposing or collecting impact fees or proportionate share fees on development for three years unless the governing body voted by a simple majority to do so. However, Sen. Nancy Detert refused to accept the House amendment that would have imposed the requirement. Unfortunately, the two year extension of building permits issued by local governments, DEP, or water management districts was amended into the bill. This provision has been passed every year since the great recession and, while this version is supposed to limit the extension to only the stated two years, that can be changed by future legislatures. The bill passed both chambers. Changes in the situation in different locales mean the circumstances that applied when the permits were first issued may no longer apply. The perfect example is the Central Florida Water Initiative which has discovered that development will demand more water than the aquifer can deliver within only a few years. Surely permits issued prior to that finding should be reassessed. This bill as originally filed would have preempted local governments by making any fuel terminal a permitted and allowable use, even if it had been a non-conforming use for years. The environmental community and local governments were able to work with the sponsors to get an amendment that allows fuel terminals that are non-conforming uses to remain in that classification. The bill passed. This bill authorizes, but does not require, the Department of Transportation to raise the speed limit on Florida’s roads to as much as 75 mph. Governor Scott has said he will veto it because of law enforcement’s concern about safety issues. Environmental concerns about the excess use of fuel were not a factor in his decision. The bill passed both chambers, but has not yet been delivered to the Governor. Sierra is glad to report that this bill was amended to remove the ability of private insurers to issue “consent to write” policies that could have been under priced and that would thereby promote coastal development. The bill passed both chambers. Sierra regrets this bill was passed without the amendment clarifying that liability protection does not extend to brownfield site rehabilitators who are incompetent, who fail to be diligent, or who seek and receive a change in the approved land use of the site, that contributes to another party’s suffering property damage. As passed, a party suffering property damage will have no recourse. Coastal Management by Rep. Renuart and Sen. Bean as sections 12 and 13 of HB 7093 (See lines 1915-2012 of the enrolled version of the bill: http://flsenate.gov/Session/Bill/2014/7093/BillText/er/PDF .) The language retains the requirement that FWCC be consulted before the issuance of areawide permits and the eligibility for general permits is limited to swimming pools associated with single family homes and to minor reconstruction of coastal armoring structures.The provision that if DEP chooses to award a concession within an aquatic preserve, it is to do so based on the recipient entity having the best qualifications, and the requirement for an opportunity for public comment is also retained.